Received a Juris Doctor degree from the University of Virginia School of Law in 1975 after graduating with a Bachelor of Arts from The American University in 1972. After law school Mr. Koster joined the Kings County District Attorney’s Office as a prosecutor. In a distinguished career he became one of the youngest deputy chiefs of the trial bureau in the history of the office. In this capacity, Mr. Koster supervised trials in one of the largest criminal jurisdictions in the United States. He supervised one of the city’s largest staffs of trial attorneys, supervisors and detectives. In continuing his public service, Mr. Koster served as Counsel to the Criminal Justice Coordinator to the Office of the Mayor of the City of New York. In this capacity he advised the mayor’s office regarding a variety of issues concerning the mayor’s legislative agenda as it related to the criminal justice system. After moving into private practice, Mr. Koster was a founding partner of Koster, Brady & Nagler, LLP. He currently serves as managing partner of the firm. In this capacity he has been involved in a wide variety of insurance defense litigation, including products liability, professional liability, medical malpractice, and general liability. Other areas of specialty include labor law, employment practices litigation and insurance coverage issues. 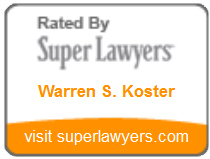 Mr. Koster is admitted to practice before the state and federal bars of New York. He is also admitted to practice before the bar of the United States Supreme Court.